Because I am scouting for new awesome cafés, restaurants, bars and more in Charlottenburg at the moment, I do have a lot of coffee and drink dates. I am not complaining, I love it, but sometimes I don't want to just consume something with my friends. I recently discovered, that museums and shops offer a lot of do-it-yourself workshops, which I found really refreshing: From baking, painting to creating my own bath bombs, I tried it all. I would also highly recommend the workshops for your unique birthday party or as a gift for Mother's Day. To put it in a nutshell, here are my Top 5 workshops in Berlin. The Petits Fours patisserie Latodolce is located in the Gräfelkiez — its Italian for “sweet side”. The owner Natalia attended Espai Sucre in Barcelona, an experimental rather than classical culinary school dedicated entirely to desserts. 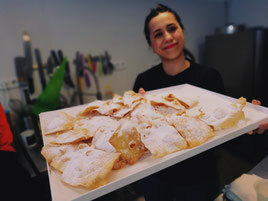 But her patisserie Latodolce is not only ready-to-eat and takeaway cakes, she also hosts a variety of pastry and cooking workshops, and creates exclusive workshops for her customers. Last month Lucie from PonyHütchen inspired me to take matters into my own hands. I learned how to make my own handmade beauty products like bath bombs by simply using natural ingredients and high quality fragrance oils as well as organic essential oils. Her hands-on workshop is the perfect way to discover how easy it can be to make homemade body care using ingredients everybody has at home. In the next edition of the DIY workshop at PonyHütchen, Lucie will walk you through how to make bath bombs, scrub cubes, bath salts and body peeling – everything to treat yourself. The museum devotes itself to the Jugendstil, kind of Déco and Funktionalismus. Here you can walk through a Jugendstil room with historical furniture and art. On the first Wednesday every month the entry is free as well as they offer free guided tours and workshops. Every Sunday they open their printing shop from 13–17 pm, where you can also get creative and try different printing materials (its for free). 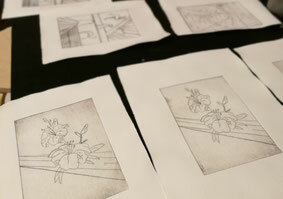 On certain dates they also organize art workshops from 14–17 pm like linocut (Sat 12.05. + 09.06. ), Etching on plastic (Sat 02.06. ), postcard printing (Sat 26.05.). This DIY workshop costs 29 Euro and can be book via info@broehan-museum.de. 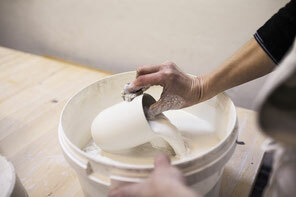 Manufactory Berlin is in open porcelain studio offering studio space, teaching and small scale production on commission. Manufactory was founded by Uta Koloczek in 2010. Once a month she hosts a 6-hour crash workshop in which you can manufacture a gypsum form, with which you are enabled to pour porcelain. Dates are published by newsletter or can be enquired by email at utakoloczek@gmx.de. The workshops are mostly scheduled on Wednesday between 9–15 pm. After a theoretical introduction the participants learn how to create the gypsum form in which you pour the porcelain and are also shown all techniques of decoration and printings. Afterwards the mugs will be glazed, burnt and can be picked up two weeks later. The Barn teaches the Art of Latte. Established in 2010 in Berlin, they are one of the most recognized specialty coffee roasters in Europe. In principle their green beans are fresh in season and from traceable sources. They are quality leaders in roasting - all their baristas are linked back into our roast process to ensure highest performance of our coffees. 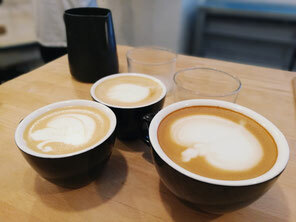 Now they also offer Barista workshops! Absolutely worth a try, even when you are not a coffee junkie like me. But I have to admit, I was drinking quite a bit :D.